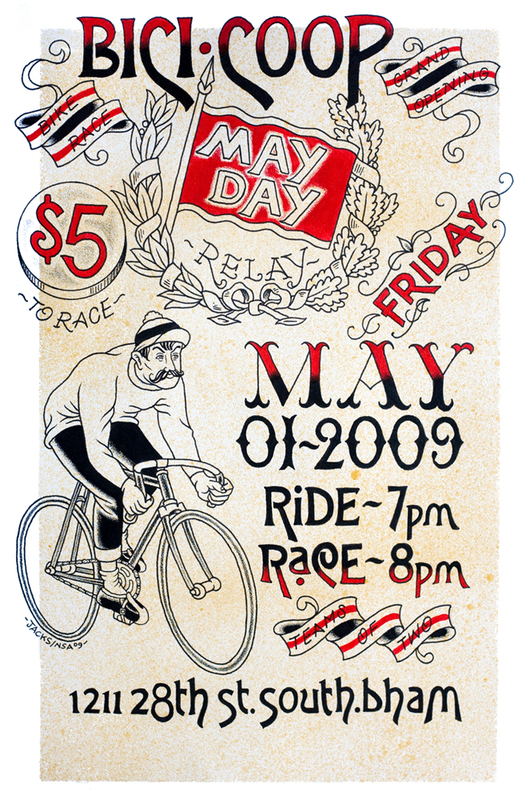 BikeSkirt » Blog Archive » May Day! that’s right kids. anna, elisa, and i have been working round the clock on getting the shop ready for our may 1st grand opening. special thanks to terry jacks at non stop art, the guys at cahaba cycles, banjo brothers, DTMT, and our good friends at primavera coffee roasters. Also thanks to all the folks who came in to help us finish build out. the race format is a relay. each racer will circle a highland ave loop (starting and ending at the bici shop). we will probably have heats of three teams, timing each teams’ time and the team with the best time wins. pretty simple. we will have some music inside the shop, as well as giving tours, taking donations, and sipping on brewskies. that being said this event is BYOB for those that are of age. if you have any old bikes, tools, storage shelves, or money you don’t really want we promise we will put them to use so bring ‘em down. Wish was in Alabama, girls! I’d be there! i totally want to get that dude tattooed on my arm right now! so cool! bikes, skirts and coffee – wish I could swing by have funnnn!! !